A full colour Camille Daybill would have to be one of the most commonly misrepresented Australian movie posters.Australian Daybills were rarely dated and that can sometimes make it difficult for collectors to determine the time that the poster was printed. Popular films were often re released or reissued and posters were often printed specifically for those later releases. There are some clues that can help identify Australian posters accurately including the size of the daybill, printers details, censorship logos, distribution and studio notations or logos and some other indicators that can lead to a fairly definitive conclusion about the date of release. Pressbooks can be of help along with trade magazines and Newspaper archives through Trove and other sites. Only one of these is correct. The first example is obvious. 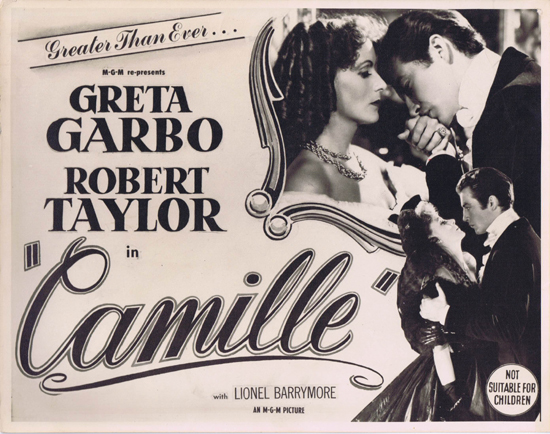 The original release for Camille was 1936. For advanced collectors it should be quite clear that an original daybill for Camille would have been a long daybill measuring approx. 15" x 40". Moving on to the second example and there are reasons why a collector might think that the Camille daybill would be from the 1962 release of the film. However this one isn't correct either. L.Bailey has been researching the origins of Australian posters and he writes: There was a Garbo season of films called The Star Of Stars released in the U.S.A. and Australia in 1963, hence some confusion and why the often quoted 1962 RR date for the Camille daybill. The season included 4 or 5 films including Camille, Queen Christina, Ninotchka , MarieWalewska ( Conquest ) and possibly one other and from memory was screened at the Metro Liberty in Sydney in 1963. I believe that no individual posters for the Australian season were printed. The American one sheet along with a small programme with film details were handed out at the cinema and that was the sum total of advertising material for the cinemas. No Australian daybill or Australian one sheet material appear to have been printed for any films in the season. This all makes perfect sense but the clincher and most obvious clue is with the printer. The daybill was printed by W.E.Smith. This printer ceased printing MGM daybills in 1956 so the poster could not possibly be from a 1962 release. The third option, which refers to the poster as being a 1955 release is the correct release date for this daybill. L.Bailey writes: Camille was re-released in Australia in 1955. I have a newspaper trade advertisement from The Argus, Melbourne advertising Camille being screened at the Metro Collins Street and the Metro Malvern on the 15th October, 1955. The daybill is printed by W.E.Smith who ceased printing MGM daybills in 1956 so it has to be for the 1955 release. An Australian Lobby Card set was also issued for the 1955 release of Camille. These cards appear occasionally on ebay and have been variously described from 1936 release to the 1962 release. Based on the information in this article it appears likely that they were used for the 1956 release of Camille. If anyone disagrees with any of the findings in this article, by all means send me an email and thanks to L.Bailey for his continuing research on Australian Movie Posters. Starring Greta Garbo, Robert Taylor, Lionel Barrymore.